Data has become one of the most valuable assets for 21st century businesses. Organizations are in a constant state of pressure to manage a massive amount of data in their supervision. As a result, managing the health of data centers is paramount to ensure flexibility, safety and efficiency of a data driven organization. A continually developing and changing entity, today's ...complex data center requires regular health checks empowering data center managers to stay on the pulse of their data center facilities in order to maintain business continuity. A preventative versus reactive approach within the data center is paramount to avoiding outages and mitigating downtime. Data center managers can maintain the health of data center hardware by leveraging automated tools that conduct ongoing monitoring, analytics, diagnostics and remediation functions. With the average data center outage costing even the most sophisticated organizations upwards of three-quarters of a million dollars, implementing a data center health management strategy is mission critical in today's dynamic business environment. A recent study carried out by Morar Consulting amongst 200 data center managers in the UK and US reveals that nearly 1 in 10 businesses do not have a data center health management system in place, showing that many businesses are potentially exposed to outages costing businesses thousands of dollars per minute in downtime. 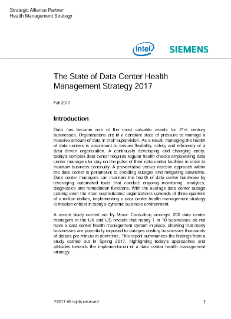 This report summarizes the findings from a study carried out in Spring 2017, highlighting today's approaches and attitudes towards the implementation of a data center health management strategy.